We’re super-thrilled to announce the public launch of our newest site, WickedCoolPlugins.com (WCP). But don’t go there yet – because you certainly don’t want to miss out on this wicked-cool offer we’re about to make you. Now, WickedCoolPlugins.com comes with 7 Wicked Cool Plugins. We first did an internal beta, then a closed-beta with a few DAP users, then we did a soft launch, and finally, we’re now opening it up for a full-on public launch! And for the next few days only, you will be able to get an insane deal on these 7 plugins. We’ve priced these 7 plugins so low during this launch, that you can literally get 7 plugins for the price of 1. And you’re never going to be able to buy them for less than what we’re currently offering. The incredible bargain that you’re getting right now, is not even the coolest part! We really wanted to make you an offer you couldn’t refuse! The 8th Wond… er, Plugin! Even though you will find 7 spanking new plugins at WickedCoolPlugins.com, we are actually about to add an 8th one! And you can get this 8th Plugin as a FREE LAUNCH BONUS (a $97 value) if you act fast. That’s what we’re calling this 8th plugin! DAPTicket (DT) is basically a support ticket system for your web site, that you can install on your own DAP-powered membership site, and have your members open tickets to get help with questions about Billing, Product Support, Pre-Sales, Technical Support, etc. A "Members-Only Ticketing System" – so you can keep non-members and expired members out. Supports Single Sign-on. If they log in to DAP on your site, they are also automatically recognized by the ticketing system, and can open tickets without having to enter their name or email address. You can force members to log in to DAP on your site first, before they can open a support ticket. This eliminates the problem of members using a completely different email id (than used in their membership account) for the ticketing system, then you not being able to recognize who they are, and then having to ask them what their member email id is after they’ve opened the ticket. As you can imagine, we too face this problem with our current support system here at DigitalAccessPass.com, which was a big part of our motivation to create this new system. You can also configure a "Renewal Link" in the rules, so if a member’s access has expired, they will automatically be taken to the renewal page where you can sell them on the benefits of renewing. A fully automated, "Do It Yourself" support system for your members: They can open new tickets, update existing tickets, upload files along with the tickets, and view the status of all of their current and past support tickets via an easy-to-use support dashboard. NOTE 1: DAPTicket is our custom fork of an open-source ticketing system, which we have customized and fully integrated it with DAP. Plus we’re offering 1 year of free support for our modified version – something that you can’t get for an open-source solution – not for free any way. And we have changed it quite a bit to work with DAP, so we will have to continue maintaining the fork going forward. 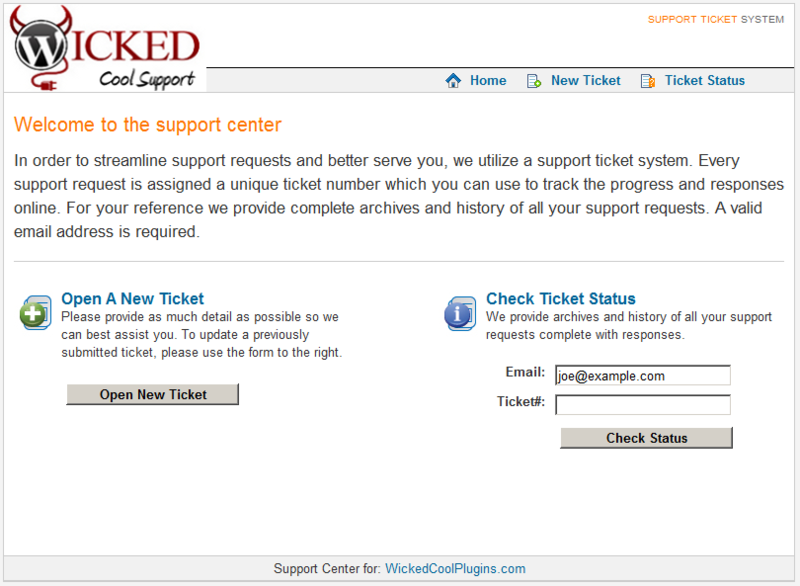 NOTE 2: We’re currently beta-testing DAPTicket on this very web site, so the plugin is not yet available for download. It will be available along with our upcoming DAP v4.3 release that comes out in just a few weeks. NOTE: We’re currently beta-testing the DAPTicket plugin on our own web sites, and the plugin is not yet available for download. It will be available along with our upcoming DAP v4.3 release that comes out in just a few weeks. So head over to WickedCoolPlugins, purchase it at the lowest price you’ll ever get it for, and when you purchase the Unlimited-site license, then you will also get the DAPTicket plugin (a $97 value) for free in a few weeks when it is launched. AND, once you sign up, you will get your own affiliate link that you can use right away to start promoting WCP to your list. And starting Tuesday, February 21st, the price will go up $10 every single day until it hits the regular list price of $167 for the 1-site license and $247 for Unlimited-site license. And when the DAPTicket software is launched, price for both 1-site license and Unlimited-site license will go up even more! But you can get it all for one low price today, PLUS the DAPTicket Bonus. PS: As always, we eagerly look forward to your comments. So please do leave behind a comment below. Can we purchase DAPticket seperately? Or is it included with the next DAP release FOC? Also what can we expect from DAP v4.3? YES … that’s I’ve been waiting for ! Finally I can integrate my support with the amazing features of DAP… Thank You & Veena Ravi! Where is that price? I can see no less than $147 for unlimited websites use. Is this special price all for one? Would really LOVE, LOVE, LOVE to see a plugin that would make it easier to protect content within the post or page (like Wishlist) instead of always having to go to the DAP interface to do so. Is there an affiliate program for those who want to promote the new site? >> I can see no less than $147 for unlimited websites use. Is this special price all for one? << Yes, $147 is already a heavily discounted price for the 7 plugins (unlimited license)... The price will start going up from Monday. Each plugin is already very unique and powerful. In addition, we are giving away the NEW dap ticket software as a FREE bonus (a $67 value) if you purchase the unlimited license of WCP for just $147. >>Can we purchase DAPticket seperately? Or is it included with the next DAP release FOC? << Yes, you can purchase it separately for $67. It will NOT be part of CORE dap, it will sell as a separate plugin and will include the entire Support Ticket app and the integration with dap. How can i get hold of it? It is going to make my site totally rock! Great to hear we will be able to purchase DAPticket separately… any idea when it will be available for purchase? The DAPTicket plugin is not yet available for download. It will be in a couple more weeks and at that point we will add a direct buy button for it. I will send an email to you with offline payment details if you want to buy the plugin now. Having a ticket system that does not require a separate log in for existing members… awesome! Question 1: Is their a way to integrate a self serve knowledge base or FAQ resource that allow members to answer questions for themselves, without having to open a ticket? Questions 2: Is there a way to set up easily accessible “canned” answers in organized categories so that outsourced VA’s (or agents) can quickly respond to tickets. Question 3: Is there a way to assign and/or escalate tickets amongst your team? I’m also interested Veena. Send me an email with the payment details. Are you planning to make this plugins “translatable friendly” for non english sites, like you did with the DAP 4.1 release adding an “Internationalization” feature? I think this will be awesome plugins for my spanish sites. Sure, we will make it more friendly for non-english sites (just like we did with dap) in a few months. >>Great to hear we will be able to purchase DAPticket separatelyâ€¦ any idea when it will be available for purchase? << If you purchase WCP - unlimited license before Monday, February 20th, 2012 (by midnight) for just $147, you will get access to all the 7 WCP plugins (unlimited license that you can use on sites you own) + the DAPTicket plugin(as bonus). If you want to purchase just the DAPticket plugin, then the cost will be $67 ONLY if you purchase it before Monday, February 20th, 2012 (by midnight). If you purchase just the DAPTicket plugin but after Monday, the price will go up by $30. It will sell for $97 after Monday, February 20th, 2012 (by midnight). Note: Even though you can buy DAPTicket plugin now, it won't be available for download until DAP v4.3, which is slated for release in a few weeks from now. >> Is there an affiliate program for those who want to promote the new site? << Sure, you can start promoting. It's the best time to promote as we are offering the DAPTicket plugin as a bonus for the next 3 days in addition to big discount on WCP unlimited license. If you purchase any of our plugins at WickedCoolPlugins.com, you will get an affiliate Id (you will find it in your members area) and you can use it to start promoting WCP! Thanks Veena. Which open source ticketing system did you build from? I would like a link to buy DAPticket now. I will only use a couple of the plug ins but I definitely want this one. What are the other plugins that come with this offer? Is it just me or is wickedcoolplugins.com down? Can’t seem to access the site. Hope I dont miss this offer, can you please contact me at this email with an update? Kathy, click on the http://www.WickedCoolplugins.com link to read about all the Plug ins. I ended up going for the package even though I just wanted 3 of them, it’s the best deal. Your site is down – I can’t get in. I want to buy the Unlimited 7 Plugins. Veena – it’s working again! Ken, thanks for reporting. A lot of traffic, the site went down for a few minutes. Back up now :). My client bought the plugins a week ago and am not sure if it’s the unlimited one or not, won’t be able to ask him until tomorrow. But if we have the unlimited one how do I check? Also, can we have a copy of dap ticket? Can’t seem to access the site. Thanks! Veena – I was wondering about pop-up blocking software, such as in browser settings, will they prevent your pop-up software from working correctly? So excited about all of this. I purchased the 7 plugins during beta — and have them activated on my site. Can’t wait to get everything all set up. And… am anxiously awaiting DapTicket!! Our popup software will not be affected by browser settings. They will work correctly regardless of browser settings. >> My client bought the plugins a week ago and am not sure if itâ€™s the unlimited one or not, wonâ€™t be able to ask him until tomorrow. But if we have the unlimited one how do I check? Also, can we have a copy of dap ticket? << Yes, your client did purchase unlimited license. And yes, the client has access to DAP Ticket. It will be available for download in a few weeks from now. We will send out an email when it's ready for download. Is the dapticket sale price $67 – $97 for unlimited license or single site? And do we get the beta release? >>Is the dapticket sale price $67 â€“ $97 for unlimited license or single site? And do we get the beta release? << It's for unlimited. Yes, we can give you beta release as long as you are ok with implementing dap 4.3 beta as well. Just wondering when the DAP ticket support plugin is going to be available along with the latest release of DAP? I seem to remember a release date of 22 March 2012? I can not wait to get the DAP ticket support in place, soooo cool.